Late March, on the occasion of its fifth anniversary, Xiaomi had announced the Redmi 2A smartphone, which was even more affordable than the originally released Redmi 2. 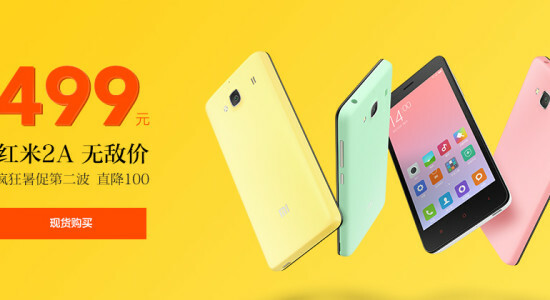 While the Redmi 2 cost 699 ($115) Yuan, the Redmi 2A had been priced at 599 ($100) Yuan at launch, making it the most affordable Xiaomi handset available on the market today. But now, reports coming out of China suggest that Xiaomi has cut the price of the smartphone by 100 Yuan ($16) with immediate effect, taking its price down to only 499 ($80) Yuan. The Xiaomi Redmi 2A features a 4.7 inch 720p HD display, similar to theRedmi 2. The panel is supplied by first tier manufactures like Sharp and AIO, and comes with very good viewing angles and outdoor visibility. The device however, comes with a Leadcore L 1860C SoC at the heart of it instead of the Qualcomm Snapdragon 410 chipset found on the Redmi 2. The SoC comes with a quad-core CPU clocked at 1.5GHz, and an integrated Mali-T68 MP2 GPU, which supports OpenGL ES3.1, DirectX 11 and OpenCL 1.1. The device also features 1 GB of RAM and 8 GB of built-in storage, which is expandable by up to 32 GB via a microSD card. There’s an 8 MP rear camera on the device, while the front camera comes with a 2 MP sensor. The phone comes preloaded with Android 5.0 Lollipop-based MIUI 6, and has a 2200 mAh battery.